Nothing new in this update, only fix one more bug with uv-coordinates on the subdivided objects. 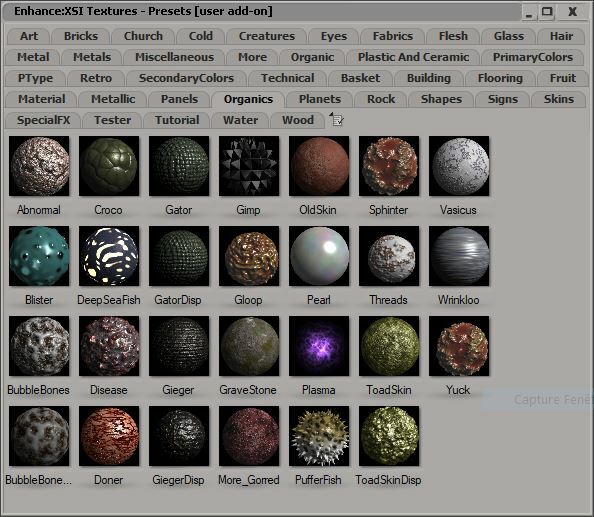 1 - Can you add most of the Cycles shaders in the Create tab ? 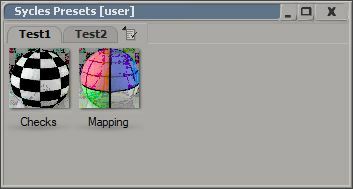 2 - Change the Cycles menu position at the top of the Nodes menu (Render Tree tab) ? Simply AWESOME! now i can start to render! Infinite thank you!!!!!!!!!!!!!!!!!!!!!!!!!!!!!!!!!!!!!! 1. I think yes, it is possible. 2. No, it is impossible. The place of the Cycles shader group determined by Softimage automatically. 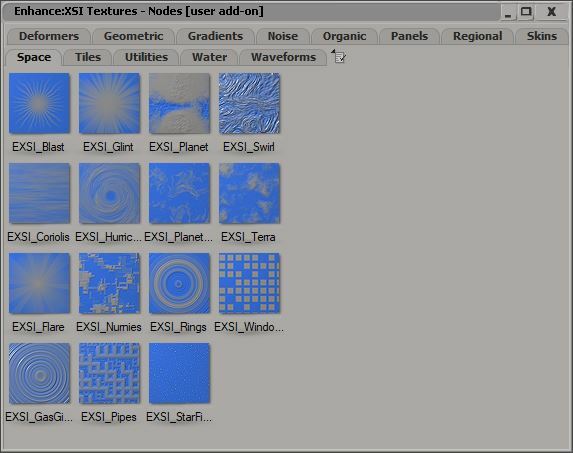 The top section of the Nodes list for default shaders, and the bottom section for shaders from addons. It is possible to place shaders inside existed groups (for example inside Illumination group), but I think this will be less convenient. Do you think next suggestions can be posted here or do you prefer by PM ? Write here. May be it will be interesting for somebody else. 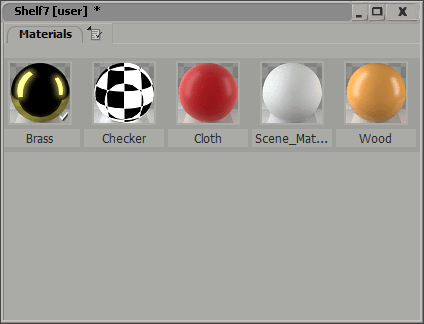 Such kind of toolbar with image presets can be done by standard Softimage customization tools. For example, you can add to the toolbar buttons and apply pre-rendered images to these buttons. As a result you will obtain toolbar with images, but when you click the image, then corresponding command executes. There are some commands for applying Cycles shaders to geometry. These commands listed on the menu Get - Material - Cycles Shaders. For example, if you would like to apply DiffuseBSDF shader to the object, then you should execute the command Application.ApplyDiffuseBSDF(). This command apply the shader to all selected objects. So, all you need is to assign these commands to your buttons with images, and you will get toolbar with presets. May be it is possible to use synoptics as alternative way. In Softimage help there are some sections where described how to create synoptic and how to use it. Custom shelfs with tabs to folders and shader icons are mentioned in the manual. I did one long ago for the Lume shaders. Hi again, i have a quick question: there is a way to render instances in xsi with cycles? thank!